The season starts on saturday and I'm pumped. We have an awesome opening day of snow in the moring heavy downpours the rest of the day with heavy wind. Even hearing all of that I cant wait. Wont be much sleep the next couple of nights. 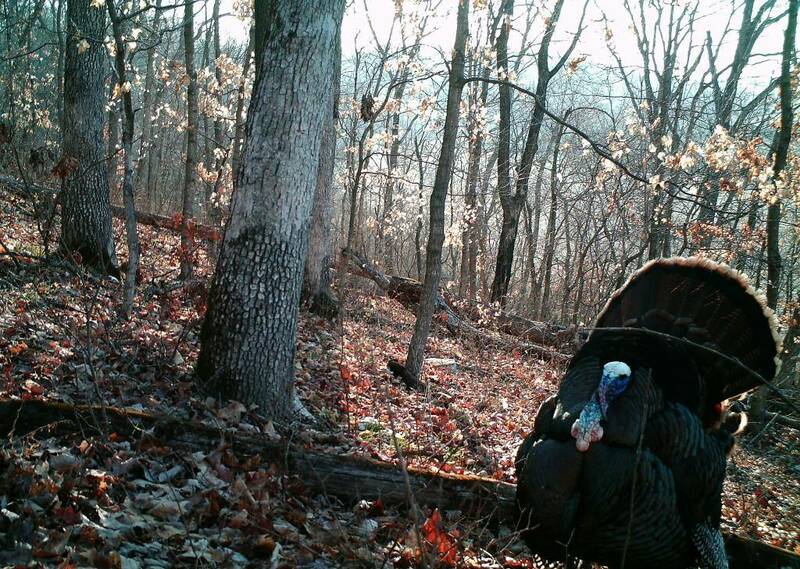 Just looked in a valley where my bow blind is set up and 3 long beards were walking around it. How many turkeys are you allowed to shoot? There are no turkeys here on the island. Just deer and squirrels. Thanks, Their is no limit on how many tags you can get. You get one from the drawing and then you can get extra tags. Their is still tags left now. I have 4 tags now but Im planning to get more. Take'm out Bryce, take'm on down!! Bryce 21 wrote: Thanks, Their is no limit on how many tags you can get. You get one from the drawing and then you can get extra tags. Their is still tags left now. I have 4 tags now but Im planning to get more. Dang, is that all gobblers or can you shoot hens? We're only allowed 2 gobblers in the spring and you can only shoot one the first week of season. Them are all gobblers. If I really wanted to saturday and sunday is the youth hunt and thier is no limit on the amount of birds per day so I could shoot all of my tags if I reall wanted to. I proablly wont even pull up the gun or draw the bow back. Going to get my brothers and relatives on birds first. Plus we got a few cows that are going to proablly have caves right during opening morning. Winds are up to 35 mph for the morning. Hopefully some of the guys decide not to go out in the moring. I'm off to go sit in the tent. Instead of rain right now it's snowing. Just got done with feeding calves for the last hour so now it's time to get a longbeard. Wish me luck. We got out their plenty before dark and it was blowing pretty good but we found a place where the wind wasn't blowing at all. It was pretty nice for a change. While I was getting settled in my tent an owl hooted and the woods lit up on fire. Thier was atleast 8 gobblers thundering back in the wooods. I was starting to shake already. We waited quite awhile and they were a gobbling and a yelping like you never heard it. All of sudden it got quite and I knew it was fly down time. They were not far behind me but they werent ready to come out in the feild. They grouped up and they were a coming. They were coming down an old trail and it was working perfectly. Then a hen came out with 15 other hens behind her. Their was 2 bearded hens in the group so I could have shot them but I decided to wait for the toms. I could here the toms coming down the tril spitting and a drumming with a lot of gobbling. I got my brother pointed in the right direction and I was ready also. I did one more hen yelp and boom boom rang out behind us. My heart fell as soon as I heard that. Here their was a 10 yeard old girl sitting behind me in the woods. She missed both times which hurts the most. Had a fun hunt until then, but maybe this afternoon or tommorrow. Sounds like an exciting hunt anyway. Had to work this moring. While I was feeding calves I looked out into the pasture and their were 2 toms feeding with the cows. Did you get anything Mtc1? I've hunted every day so far and I've been pretty close to toms everyday. It's also snowed and rained everyday of the seaoson so the birds are not fired up at all. Anyone get any birds yet? I've been hunting hard since wedensday and I hunted every hour other than the ones while I was in school. I'm exausted and put over 30 miles this weekend looking for this one bird. He drives me nuts. On Wedensday it was all day thunderstorms so nothing was really moving or I couldnt see them. Thursday We got dumped on by snow so we did not see much and it was blowing 40 so we could not here anything. Friday moring the wind was still blowing hard and the birds did not come off their roost until I had to leave to go to school. Friday night was a whole different story the wind died down and it was only lightly raining so I actually had a chance to hear one. 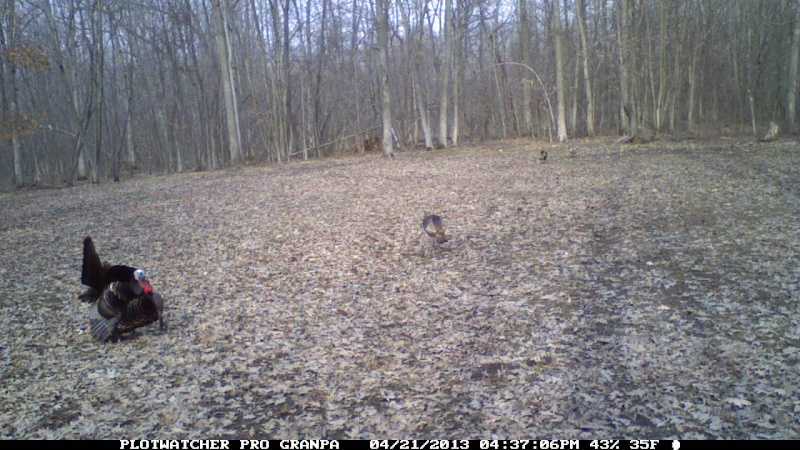 2 jakes were fighting down about a 150 yards below me and hens came out in the feild. Then I saw the big fan come out of the woods. I had a half sturt decoy and when he saw that he came a running. I was shaking so bad and I though it was a done deal. I was wrong a he stopped at 70 yards in a small clump of brush and trees so I couldnt even take a poke at him. Saturday moring he was a gobbling like crazy with 6 other toms. I snuk in to about 100 yards of his roosting spot of cours a heavy snow shower had to hight right at that time. He must have flown down some time while it was snowing and went the other way. Saturday night I put the stalk on him and was about 150 yards away from him when he decided he was sick of the feild and decided to go down by the river and pay no attention to my calling and decoys. This morning he was a gobbling like crazy up on the roost then When he hit the ground he stopped and and it started snowing and he would not gobble so I could not sneak up on him and he was paying no attention to me and I started hiking on this one big farm to find another group and all I found was a possum. Thought I would save a few turkey eggs so I thought I was test out a different type of turkey shot worked pretty good. Then I hunted all day and got to within 80 yards of him tonight in a swamp and I could not see him but he gobbled a few times and then he went with the flock of hens up into some houses to eat out of their bird feeders so I could not chase him no longer. I got to tuesday to get him and I think I got him figured now. Sorry for the long story but man does this bird get to me. sounds like a good bird!! Good luck getting him! Any luck so far Bryce? Nope, my season has been closed for the last week. I had a tom 20 yards away the last night of the season. All I saw was his fan behind a brush pile and all he wanted was to see what was in the feild and then he went to roost. My season opens again in 1 week, so maybe then. My buddy has tommorrow so I set a trail camera up for him and this is what we got. I'm excited and I dont even get to shoot. Verry cool pic bryce! Hope he can connect ! WE GOT HIM!!!! So me and my friend decided we could go out a couple of hours tonight. WE were dropped off on the road and we started our way back in. My friend has a cabing about 300 yards in. Most of his stuff and some of my stuff were in. We got the gear and we walked about 100 yards on the trails when I see a hen and he sees the tom. We both drop to the ground and I set decoys up and started calling. He had 6 hens so I figured he would follow the hens. Then we snuck up the trail some more and got my friend set up on big tree. I set the decoys up again at 3 yards. Then I sat right behind him and started calling. He had a slate call with him so he started calling and I started clucking right with him. I saw him again sneek through the woods and this time he was headed our way. Then we started calling a lot to bring the hens in. It worked like a charm the hens came to about 40 yards away and then the tom seen the decoy which I was pretty much laying under and he came and came. At 20 yards he either saw my friend move the gun or me and he stuck his head up. He was just about to walk away when my friend layed the smack down on him. I havent weighed him yet but I'm guessing 25 pounds with about an 8 inch beard. The exact same bird as the one in the picture above. This all happened in about a half an hour.